So I’m all about local and local presence management, but today I’m going to take a different “local approach.” We’re going to dive into how to convert customers that visit a local business into online fans and, eventually, brand ambassadors. Why would you want this? Because the more a customer sees a business name, the more they think about it and build up loyalty to the business. 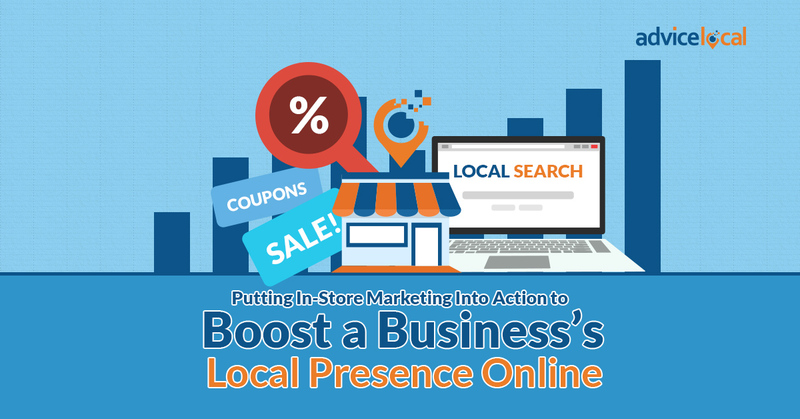 It’s possible to improve a business’s local presence online using offline marketing tactics. Creative business owners who support their online presence by increasing engagement through in-store initiatives can motivate local customers to follow them on social media, check-in on Facebook, write reviews, and share branded content online. When consumers decide to visit your store, it’s safe to assume they’re already interested in your products and brand – but that doesn’t guarantee that they’re following your social channels or engaging with your brand online. Local customers who aren’t following your business on social media can be encouraged to do so by sales associates who tell them about the frequent promotions and discount codes announced online. Once they’re engaged online, getting local customers back into the store more often will come easy. Generate online activity by asking in-store customers or patrons to check-in on Facebook. Since almost everyone has a mobile phone in their pocket with on-the-go access to their social media accounts, it’s easy for customers to connect on the spot, like your Page, and check-in to your establishment. Offer a worthwhile bonus to those that show proof of their check-in. It could be something as simple as a free dessert or an extra 10% off a sales item. Be sure the business has free Wi-Fi so there is no excuse not to do it. Happy customers are more likely to write online reviews for businesses that make it easy to do so. Whether there are cards with simple step-by-step instructions near the checkout or customer service reps that explain the process to customers, this is an easy way to boost a local business’s online reputation and placement in search. Another option is to include a link to review sites on the sales receipts (either physical or digital). Not only does a limited-time sale or special event create the interest and urgency needed to draw more consumers into a local business, it can also help with online visibility. For instance, local businesses can inject some extra life into their seasonal sales by having greeters in character to welcome guests at the door on weekends. Another idea is to have a daily drawing for in-store shoppers. (Remember Kmart’s bluelight special!) Don’t forget to harness the energy from the event to boost the business’s social media presence. Take it a step further and get customers to share selfies with their purchase and a specific hashtag online. Of course, you’ll want to turn this into a drawing, where the winners will be announced on Facebook – and they’ll have to follow to see if they won. Apply these tips and keep customers coming back locally every time! What are your favorite ways to inspire in-store customers to engage online with the businesses you represent? Be sure to come back next week for more local marketing tips from the #QueenofLocalSEO.